Mr Robert Kyagulanyi known as Bobi Wine has dismissed the long serving President of Uganda, Mr Museveni's promise to fight corruption as political propaganda. Kyaddondo East Member of Parliament, Mr Robert Kyagulanyi has scathingly reacted to President Yoweri Museveni’s latest promise to fight corruption, saying the head of State has lacks the will to decisively tackle the vice. On Monday, Mr Museveni while officiating at the Anti-Corruption week at Kololo Independence Grounds said his new plan is to confiscate property of public servants who steal public money. “All property belonging to corrupt officials will be confiscated. But I will first get first-hand information before confiscation of the property and I will order organisations fighting corruption to avail me with more details of stolen money,” Mr Museveni said. However, Mr Kyagulanyi, commonly known as Bobi Wine, said in a statement he circulated on his social media platforms that Mr Museveni has no capacity to clean the mess since he’s presiding over the worst corrupt systems. He said as far as fighting graft is concerned, Mr Museveni has always shot himself in the foot by appointing, reappointing and elevating corrupt and compromised people in public office. So today President Museveni has asked Ugandans to listen to him as he announces new measures against corruption. What a joke! After 32 years of empty promises, he is promising yet again! What can a man who has established, nurtured and supported political and economic corruption talk about combating corruption? A man who bribes MPs to pass decadent laws? A man who only two weeks ago admitted while in Kenya, that he bribes Ugandans, so as not to lose votes? A man who treats our nation's treasury as if it's his own purse? A man who treats Uganda's natural resources as his own? Mr President, you have no moral authority to say anything about fighting corruption. You are not just part of the problem – you are the biggest stumbling block in any effort to rid this country of corruption, patronage and abuse of public funds. * There is no evidence that Mr Museveni expected, solicited or received such money. Both the President and Foreign Affairs Minister Sam Kutesa were not defendants in the case and were not called to testify. The directorate of citizenship and immigration control failed to exhaustively account for over Shs 52bn advanced for the purchase of the biometric kits to be used in the national identity card enrollment project. Appearing before the parliamentary public accounts committee (PAC) today, immigration officials said the procurement process was ‘hijacked’ by the Internal Security Organisation (ISO) who should explain better how the money was spent. At least Shs 52bn was spent on the purchase of biometric kits and other equipment. They included laptops, cameras, finger print scanner, signature pads among others. In his FY 2014/15 report, the auditor general, John Muwanga noted that the providers of the kits presented a lump sum figure of Shs 52.2bn as opposed to the unit cost of each kit. "This made it difficult to make a comparison of the bids. Further, it was not possible to compute the liquidated damages as a result of late delivery of 3246 spare batteries and 3258 USB hubs", the auditor general's report notes in part. Godfrey Sasaga, the director citizenship and immigration distanced his team from the purchase of the biometrics kits, saying the procurement was hijacked by ISO following a cabinet resolution that reasoned that the issuance of the national IDs was a national security matter. PAC chairperson, Angelline Osegge tasked the immigration officials to name the items in the kits in vain. “Whether it is technical or scientific, there is no product called a ‘kit’. Here you were buying an item. The item constituted a kit, so [you should] have included the prices of items in that kit. Now, what you have given us does not even give us that information”, said Osegge. “I think that is where the procurement problem was and I admit there was that kind of gap in all this information [provided]”, Sasaga responded. Gerald Karuhanga, the Ntungamo municipality MP accused the immigration officials of providing the committee with incomplete documents. “No, no. No. This is very embarrassing because you can imagine item A; laptop Poland 4,258, unit price [not] included. Finger print scanner unit price [not] included, signature price [not] included - nothing. You don’t want anybody to know the unit price of any these items”, Karuhanga charged. MPs blamed the immigration official for negligence for alleged failure to pay attention to costs of particular items, which could have cost taxpayers loss of money. “You’re the accounting officer, you sign off this money. So for you, what were you signing off for?” Karuhanga asked. “For a kit!” Sasaga answered. “Yes” Sasaga answered in the affirmative. “Even if they gave you an empty box? For you are just interested in a kit”, Karuhanga further prodded. “The kit had components in it. The problem and I agree with you, is that at the procurement level…” said Sasaga before he was cut short in his submission. “Mr Sasaga we are talking about Shs 52bn, so you ought to have been interested in what was in this that we are paying for” Karuhanga said. PAC chairperson Osegge noted that ISO doesn't have the prerogative to flout procurement laws, saying they will not hide under classified expenditure. Karuhanga said according to the documents before the committee, the procurement process was handled by Deborah Katuramu, the secretary in the Office of the President and Dan Mugisha, the ISO contract manager. The committee said it would resolve on how to proceed on the matter. She advises that three former ISO staff should submit accountability for the sh6.9b. By Chris Kiwawuloment (IGG) has ordered the directors of Uganda Veteransof Ial Organisation (UVETISO) to account for sh6.9b of the sh10b benefits eceivy the majority of intended beneficiaries. Justice Irene Mulyagonja, in a fresh order, has said three former ISO staff; Jeff Kiwanuka, Jamal Kitandwe and Bernard Kamugisha, who represented over 500 ex-ISO staff, should submit accountability for the sh6.9b to the finance ministry by January 17, 2015. “In the event that the signatories to the UVETISO account fail to account for the monies by that date, the Director of Public Prosecutions should initiate an investigation into the loss of the said amount (sh6.9b) with a view of prosecuting the signatories to the account for the theft and/or diversion of public funds or other appropriate offences,” the IGG recommended. Over 1,000 ISO staff were retrenched in 1993 without being paid terminal benefits. Five hundred of them sued the Government, which subsequently agreed to pay sh39.18b to them. Court had initially awarded the retired soldiers sh72.4b, but the Government, through the Attorney General, negotiated with them and they agreed to take sh39.18b, which the Government was to settle in its entirety. The initial sh10b was released to UVETISO, but the IGG halted further payments after some would-be beneficiaries alleged mismanagement. A big part of the money was reportedly taken by the lawyers, according to the IGG. Mulyagonja also directed that no further payments should be made to Matovu and Matovu Company Advocates, who represented the ex-ISO staff in the case. She noted that the bigger number of the 1,078 beneficiaries of the judgment in High Court Civil Suit did not bind themselves to pay any fees to the advocates. “It was also manifestly unfair and illegal for the self-appointed representatives of the beneficiaries to pay almost 70% of sh10b to advocates and other persons as expenses without consulting and getting the written consent of all beneficiaries. They, as a result, deprived the beneficiaries of a large portion of their benefits in the judgment,” the IGG said in an interim report released Monday. Kiwanuka, Kitandwe and Henry Waibale (now deceased) were originally representing the group of over 500 retired soldiers in the court case that took over 10 years. On winning the case, however, Kiwanuka and Kitandwe were joined by Kamugisha with whom they formed a company called UVETISO, on whose account in Crane Bank the first installment of sh10b was remitted. The sh10b was remitted to the UVETISO account on June 18, but sh2.5b was withdrawn in cash on that very day and another sh2b was withdrawn the following day. By August 15, there was only a balance of sh31.7m on the account. This prompted some of the former ISO staff to petition the Attorney General, IGG, ISO and the office of the Minister for the Presidency seeking their intervention. On August 22, the IGG wrote to the finance ministry, stopping further payments, setting up a stage for a clash with the Attorney General, who questioned legality of the IGG’s order halting of the payments. 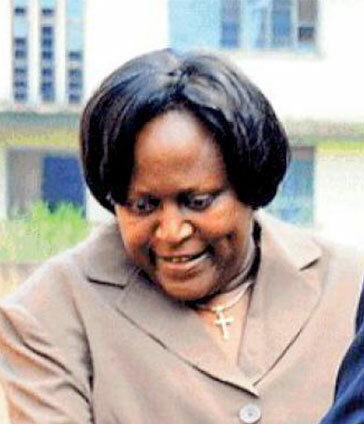 Kiwanuka, Kitandwe and Kamugisha also petitioned court, which halted the IGG’s investigations. Due to the court’s decision to halt her investigations, the IGG asked the Auditor General and ISO to carry out a physical verification of the former ISO employees entitled to terminal benefits, including establishing those who are deceased and the legal representatives entitled to receive the benefits on their behalf. The IGG further asked that the finance ministry directly pays the terminal benefits to entitled and verified beneficiaries as well as legal representatives of the deceased beneficiaries identified after verification. In her interim report, the IGG criticized the courts for the increasing tendency to issue orders halting investigations into alleged corruption. Lira municipality town clerk, Daniel Christopher Kaweesi and the principal finance officer, Patrick Awio have been arrested over alleged financial mismanagement. The arrest follows a directive by the Local Government Accounts Committee of parliament to whom the duo failed to present credible accountability for more than Shs 224m spent in the financial years 2013/2014 and 2014/2015. They were summoned to respond to queries in the Auditor General's report for the two financial years for funds that were not adequately accounted for. The report indicates that up to Shs 78.3m was not accounted for by Lira municipal council during the financial year 2013/2014. It further indicates that another Shs 146m was not accounted for in the financial year 2014-2015. Of this, the committee heard that Shs 130m was paid out as compensation to Joseph Olet, a resident whose house at Ojamma village was erroneously razed during a community road opening. Kaweesi told the committee that Shs 6m was used to compensate Sarah Ebong, who was arrested and tortured by municipal law enforcers in 2007 and Shs 10m was paid to David Okello, the interdicted Lira municipality council inspector of schools. But the alleged beneficiaries Olet and Ebong denied receiving payments from the council. Committee chairperson, Winifred Kiiza ordered for their arrest and investigation by the police. She also ordered for the arrest of Okello, the indicted inspector of schools, to explain how he spent Shs 10m advanced to him. Mansur Suwed, the central north regional police spokesperson says the two officials are still held at Lira police pending investigation into their case.